Nakasendo Route connects Edo and Kyoto. Kiso Road was known as a most steep mountain path in the Nakasendo Route. For that reason the post stations and the checkpoint were placed in Kiso and the town has flourished as an administrative, economic and cultural center. How about walking in the footsteps of every period in history, along with the changing seasons? Kozenji Temple is famous for its large dry rock garden called 'Kanuntei'. It is said to be the largest of its kind in Oriental World. It represents the beauty of clouds flowing above the mountsins. People had great difficulty in cultivating rice paddy fields in the Tabanosawa area. This monument was built to pray for the ones who passed away during the cultivation. 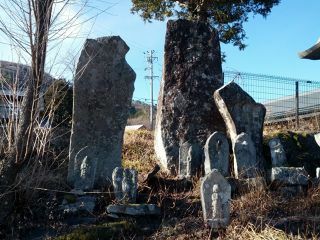 Kumano Jinjya is a shrine located at the enterance of Kaida Kogen highland which is believed for its blessing for long life and disaster prevention. Built on 1854, it is said to be one of the largest shrine pavilion in the Kiso area built like this shrine. This monument was built around 220 years ago to honor the legacy of Hikosaburo Nakamura, the pioneer who first established rice paddies in this area. The region was then further developed, creating the Tabanosawa and Nishino areas. Stone buddha built for Heijiro, who shouldered all the responsibility and been decapitated for the accidental fire of the mountain burning event. Bato Kannon Goddess of Mercy is a guardian for horses and Maruyama Bato Kannon is one of the three major Kannon in the Kiso area. People used to pray when a horse was born, and the bell rang everyday for a new born horse. Within the 1900 stone budda on the Kaida Kogen highland, 1500 of them are Bato Kannon. 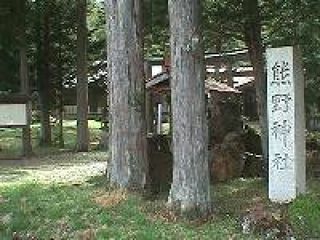 This is a sacred place of the religion of Mt. Ontake. 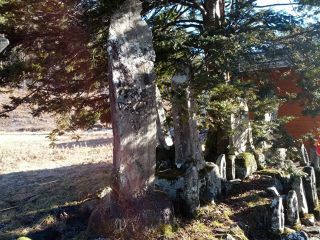 As you climb up the stone stairs, a shrine and giant rock wall appear. It was originally built in Daitsu-ji temple but it has been relocated to various places which now lies next to the festival museum. Miyanokoshi-juku is one of the 69 post towns on the Nakasendo trail. Kamiyabashi is at an enterance of Gombei pass which leads to Ina. They have fire defensive wall and water supply in the post town. Tanakaya used to run a tavern which burnt down on 1883 due to the big fire around the area. They rebuilt its residence using the fittings carried-out before the fire and the building materials carried-in from neighboring villages. 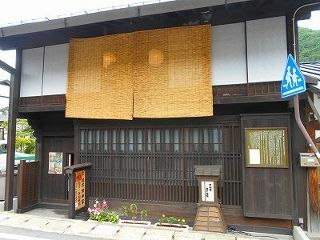 It is said to be built at the end of the Edo period from the architectural style. You will see the wave pattern carved by the carpenter at the enterance.